Daxmart.com is advertising a holiday sale and the prices are good. 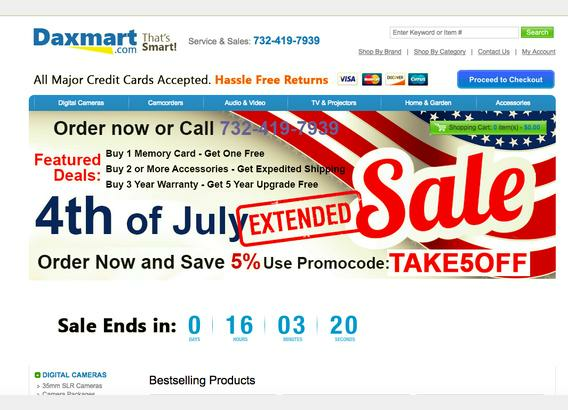 They say you will get an additional 5% off in you order in a predetermined time frame. When you order and after you give all your credit card information you are instructed to contact them again. You are told the sale is over and you are not eligible for the 5%. You are then pitched on additional products. When you refuse you are told you will receive your product in few days. Nothing arrives. When you call to enquire, you are told "the product you ordered is an out-of-country model and not available in the US. You are then pitched on buying a US version at a higher price.